The innovative IronCraft line of corbels, brackets, and table legs combine the traditional warmth of hand carved wood millwork with rustic iron-looking inlay patterns, providing an up-scale and completely unique carving. The faux-iron inlays are available in 14 designs ranging from classic designs to contemporary patterns. Each design is available in a wide assortment of wood carvings, guaranteeing you will find the perfect IronCraft statement product to use in your project. 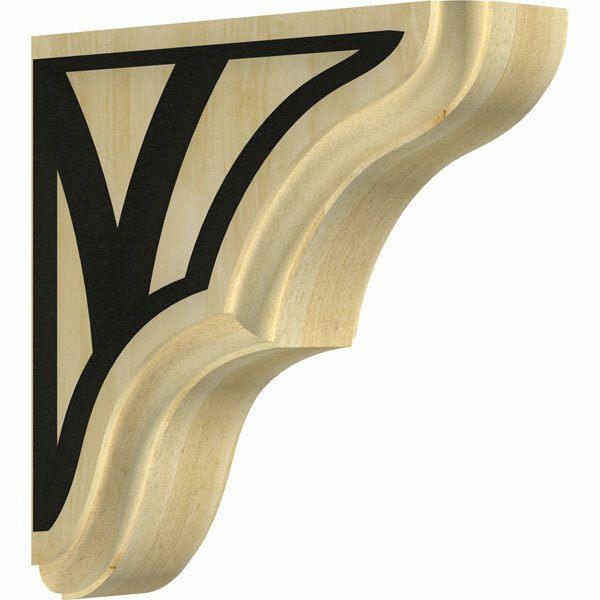 Our carved wood brackets and corbels are made from the finest hardwoods in the world. With several options to choose from, these products are a great stain grade option. Ekena has been making carved wood products since the beginning. Using our original carvings we've assembled an expansive line of wood corbels and brackets in various sizes and multiple wood species. Carved wood products are unmatched in detail, beauty, and character. We back this with years of experience and a commitment to the highest quality carvings. Whether being used to support a granite countertop or just for decoration, hardwood corbels and brackets add a classic elegance to your kitchen. Offered in a wide variety of wood species, our countertop corbels and brackets are sure to match your stained cabinets, furniture, or can easily be painted to match your kitchen's color scheme. There is no warmer focal point in any room than the flickering glow of a crackling fireplace. Surround that fireplace with a mantel supported by hand carved wood corbels, and the fireplace becomes your home's featured space. Wood corbels can be used to support the mantel shelf or simply accent it. Available in a variety of wood species, you have the flexibility of either staining or painting the corbels to match your mantel or other millwork in the room. Hand carved wood corbels are the perfect solution to supporting a kitchen island countertop. Where columns are often used, corbels and brackets can be less intrusive and more decorative while supporting just as much weight. Match your cabinets or millwork with our wide variety of our stain-grade and paint-grade wood species. Need something to help highlighting your stovetop and range hood? Hand carved corbels are often the perfect accent. The detail and design of vent hood corbels should match other millwork in your kitchen, so make sure to scour our huge collection of sizes, designs, and wood species. With over 1,000 options, we are sure to have the perfect corbel or bracket for you.